my messy hair aside—we went for the evening session with the General Admission pass. 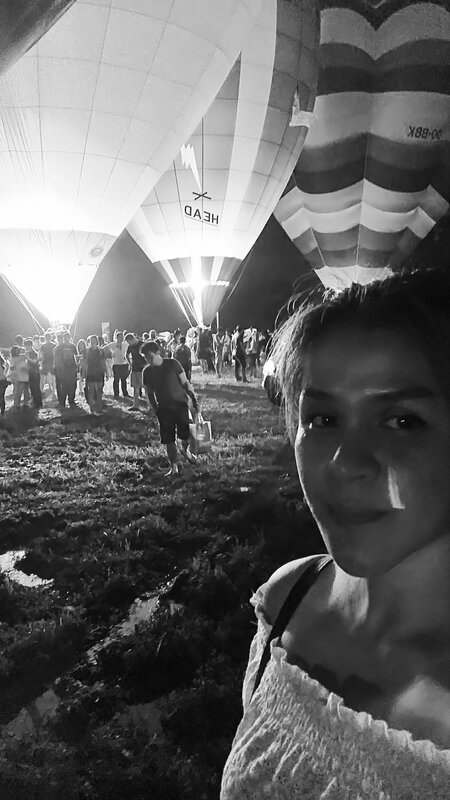 there were no flying balloons, only tethered ones—but it was a joy to see regardless. i suppose due to the recent weather all flights are scheduled early in the mornings over the course of 3 days, taking off from Putrajaya, the festival's previous location. an exclusive pass (known as MyBalloonClub pass) was sold for the morning sessions, prior to the event, where premium tethered rides are offered, with gourmet breakfast in a private lounge, along with a jazz performance. sounds fancy! that's 'Leon' behind me, a balloon from Mexico. i've got to say Wonderful Indonesia is a wonderful sponsor. at arrival we were welcomed by this man dressed in a beautiful Indonesian-themed outfit, while he walked among the food-hunting crowd in the 'Foodgasm Fest' area. we did missed out on a few more as i'm told there were more performances if we'd come earlier, maybe next time! this one was quite intriguing. here's the crowd. i was glad we found a good spot to hang out, at the far end of the field! after the sun sets, the area was filled with people, moving closer to the balloons. the highlight of the night was the 'Night Glow Show' event - the balloons were lit up following a series of rhythmic music playing in the background. the teams of balloonists were really fired-up and kids were running around having so much fun. party time! i loved how they lit up the sky. the brightest balloon of the night is a Malaysian balloon, 'Henry J'. cute name! a love balloon, of course. i liked it when the smiley face glowed in the dark. i wish i could see this one fly! it's called 'Happy Chan', a balloon from Japan. it's not a one-man job. 'Henry J' fired-up. the 'water-drop' smiley balloon is 'Dexter', from the Netherlands. he's a happy one. a blurry photo by the end of the night, actually, 9pm. we were walking back to the parking area and seeing the balloons from a distance was such a great ending to me! there was also a fireworks display but i missed a tiny bit of it while we were walking back to the car. still, i caught a glimpse and it was great. i do look forward to next year, definitely, because if there's one thing i regret, is for not viewing the early morning's mass ascension from Putrajaya where all the balloons took off. i'd be sure to catch that next year. i wish i could've seen the rooster and octopus-shaped balloons! weird shapes aside, i've always been fascinated by the science of hot air ballooning—the oldest form of aviation—the first human flight back in the 1700s—that brought us to where we are today, in the sky. yes i'm a nerd. note: this post is in-collaboration with the MyBalloonFiesta's media team, and i am grateful for the chance to share my own experience! Ken & i had such a good time—and i would've write about it regardless :) see you guys again next year! i sure need to catch the morning flights.